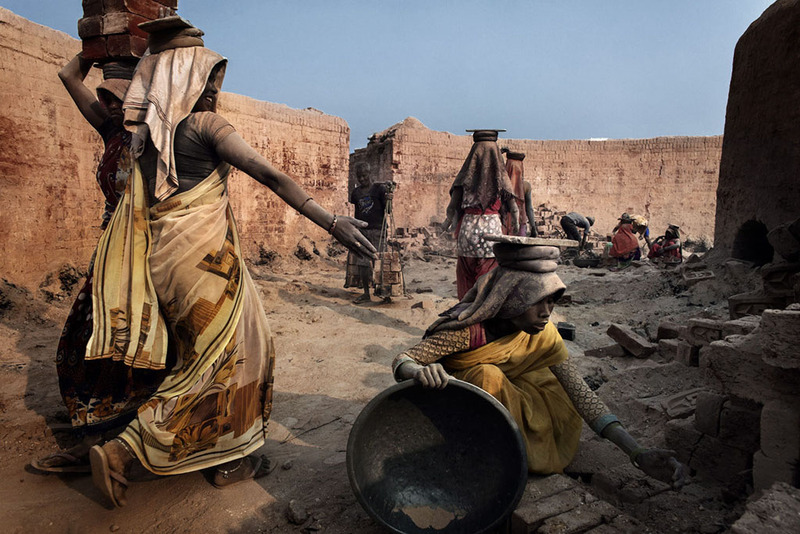 A fracture in the fracture rooted in British colonization in Central Africa. 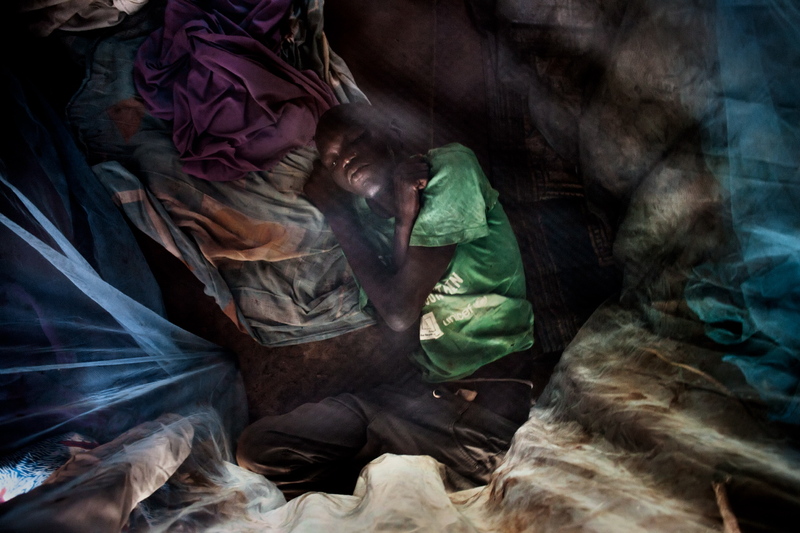 It is the story of South Sudan that, after declaring independence in 2011, is now facing an armed conflict that began on December 15, 2013, which over the years has not stopped getting worse. The figures speak of a situation out of control in a State that has literally failed: 1 million 792,000 refugees across borders , 2 million displaced in the country, over 5 million people affected by the food crisis out of a population of 12 million, about 50,000 civilians and military dead in the clashes. It feels like an enormous swamp impossible to get out of because none of the factions wants to reach a compromise with the opponent. Thus, the ethnic and political rivalry between the current President Salva Kiir Mayardit (belonging to the Dinka) and his former deputy Riek Machar (of the ethnicity Nuer) – who does not recognize his legitimacy – holds an entire population hostage, condemning it to absolute misery. A selection of these photographs will be on display in early 2018 in Barcelona in an exhibit funded by the Delegation of the Foundation in Catalonia. (Text by Sebastiano Caputo). South Sudan, Hai Matara village, 2017. Zegefina Kyendo, 54 years old. 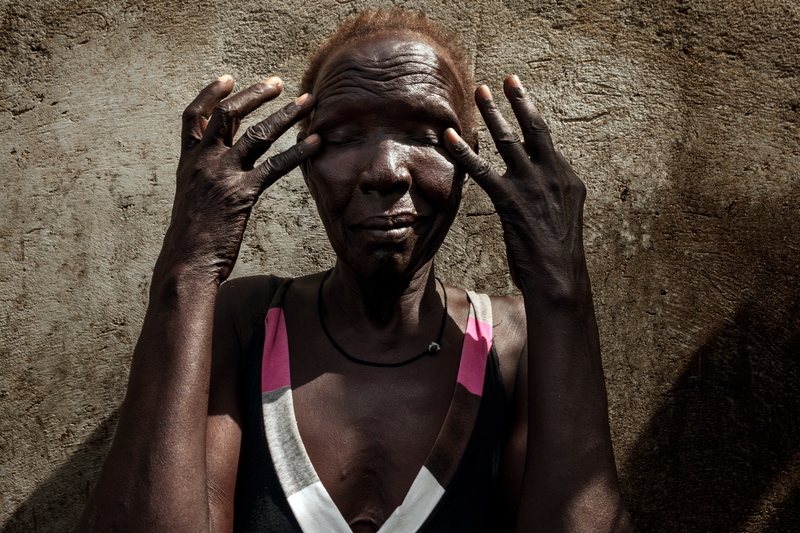 Blind since she was 10 years old, she was operated on without success. She receives assistance from her son, Lavirick Taban. South Sudan, Hai Matara village, 2017. 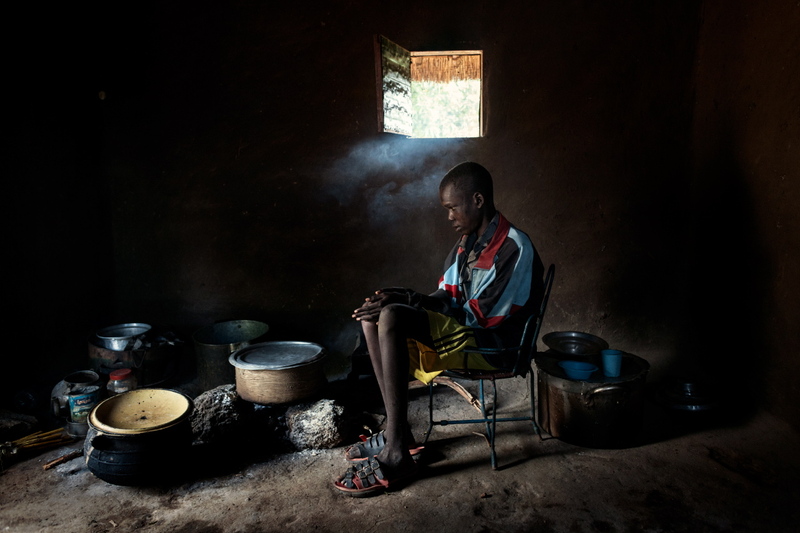 John Bidali, 27 years old, in his home. John suffers from Nodding disease. He can hear what is being said to him but he cannot understand. His mother is completely blind. South Sudan, Hai Matara village, 2017. 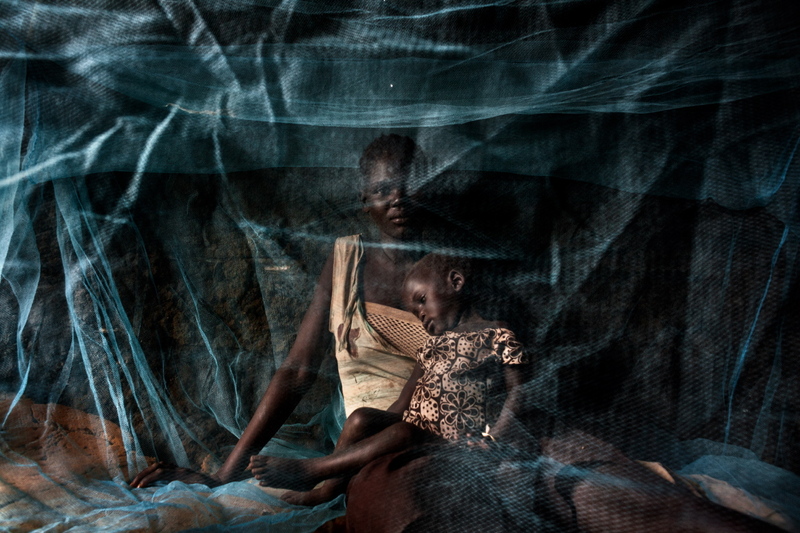 Akwor Apagin, 2 years old with her mother Ariet, 22 years old, under a mosquito net covering their bed. Akwor has just contracted malaria. 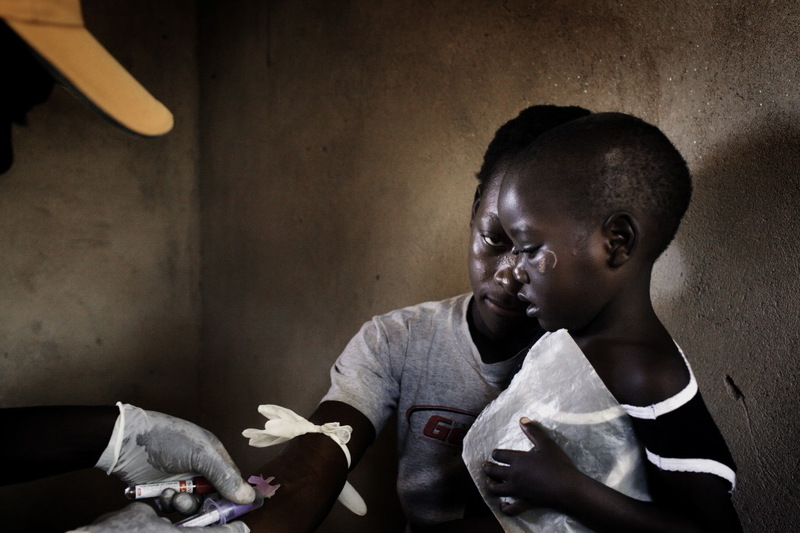 Dr. Isaac Mapeer, deputy head of Malaria Control Program at South Sudan’s Ministry of Health, said: “This year’s malaria is the most severe the country has ever seen,” There is a total of over 900,000 registered cases of malaria,”, adding that 4,073 deaths were recorded since February, this year, while 2,000 deaths were reported in 2016. South Sudan, Hai Matara village, 2017. Silvia Tabau, 30 years old, is affected very badly by Nodding disease. Her three sisters died of the same disease. South Sudan, Rajaf School for the blindes, 2017. 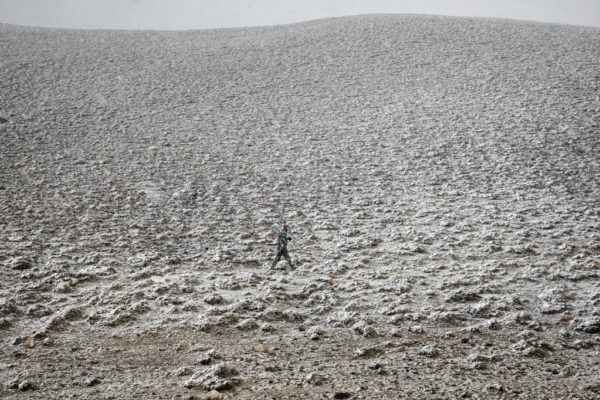 A teacher and her pupils as they walk just outside their classrooms during recess. The Rajaf School for blinds is the only operating school in the country for the blind and it provides an important context to meet and share among children with the same disability. 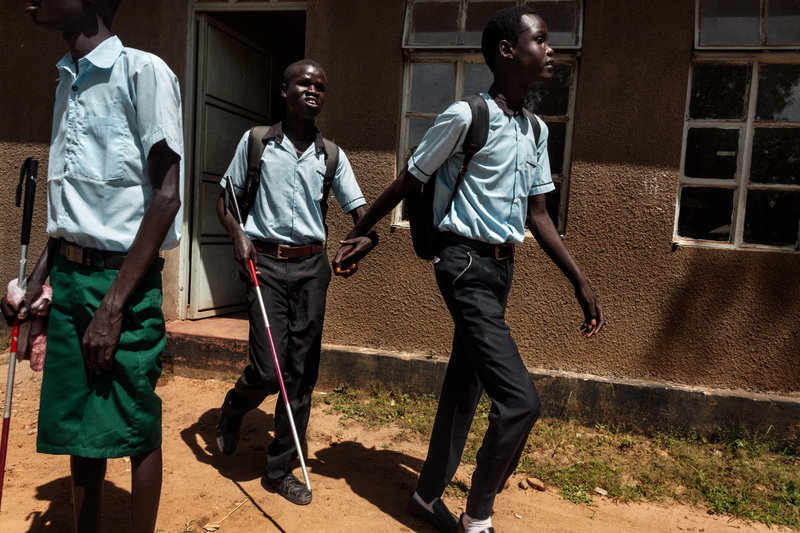 South Sudan, Rajaf School for the blind, 2017. Pupils during a morning break. South Sudan, Rajaf School for the blind, 2017. Pupils during a break. South Sudan, Keliba IDP Camp, 2017. Laurance Woll Zakal, 42 years old. 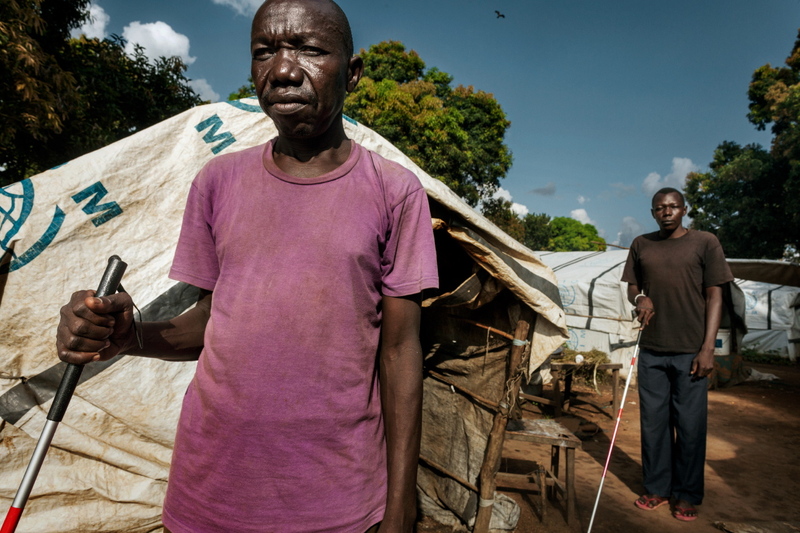 He became blind at the age of 30 and Eltazar Kombo, 25 years old, who became blind two years ago. 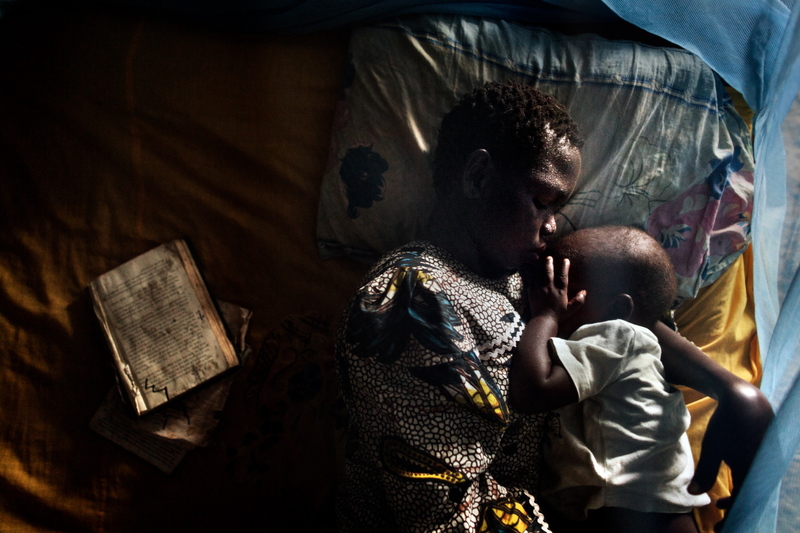 They both live in the refugee camp, as they were both abandoned by their families during the civil war. 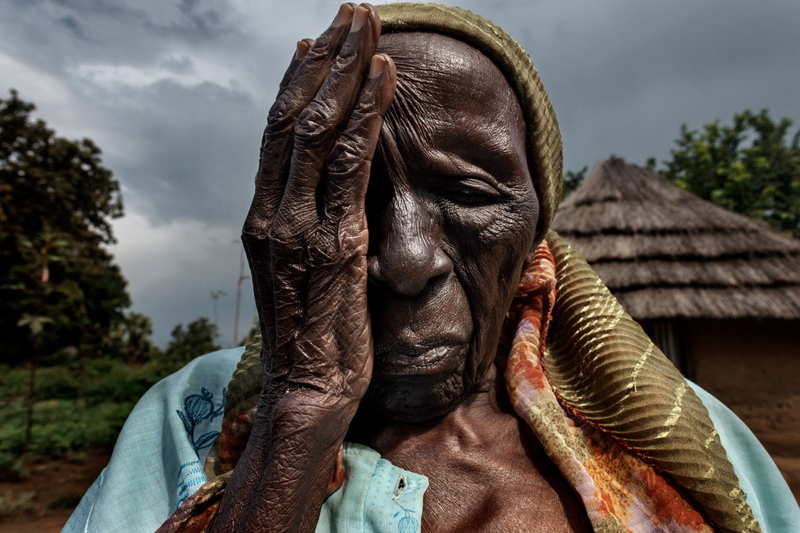 South Sudan, Hai Matara village, 2017. Sarah Salah, 4 years old, inside her house with her grandmother Margareth Kennedy , 42 years old. 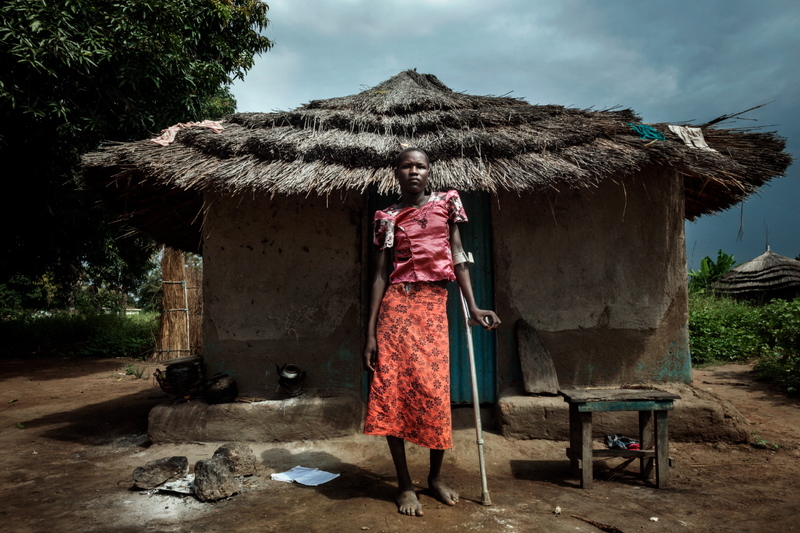 Sarah is physically disabled, she is unable to sit on her own, due to a severe muscle problem. Her mother went missing during a nocturnal incursion of rebels in their village. South Sudan, Hai Matara village, 2017. Stim Simon, 12 years old, with Clubfoot congenital deformity. She could be operated on but she cannot afford to. She is an orfan and she lives with her older sister. Clubfoot deformity is usually present from birth as the baby’s foot is twisted out of shape or position. Usually the tissues connecting the muscles to the bones (tendons) are shorter than usual. South Sudan, Mundri village, 2017. Sura Lillan, 22 years old, blind from birth with her daughter Alice, 4 months old. 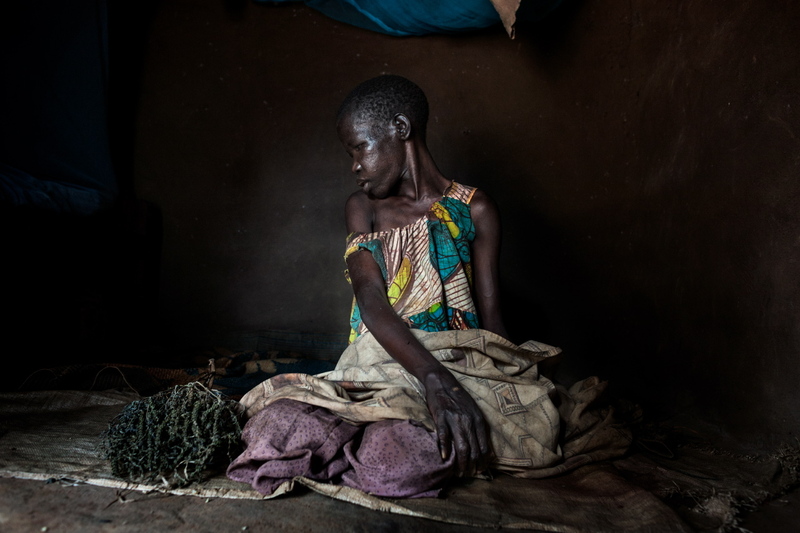 Her husband was killed during an ambush while he was travelling to Juba. Susan is assisted daily by her mother. South Sudan, IDP Refugee Camp, Juba, 2017. Martha Fares, 29 years old with her small daughter Mary, 4 years old. Mary suffers from a developmental delay, she cannot sit on her own, she cannot crawl and is not able to walk. 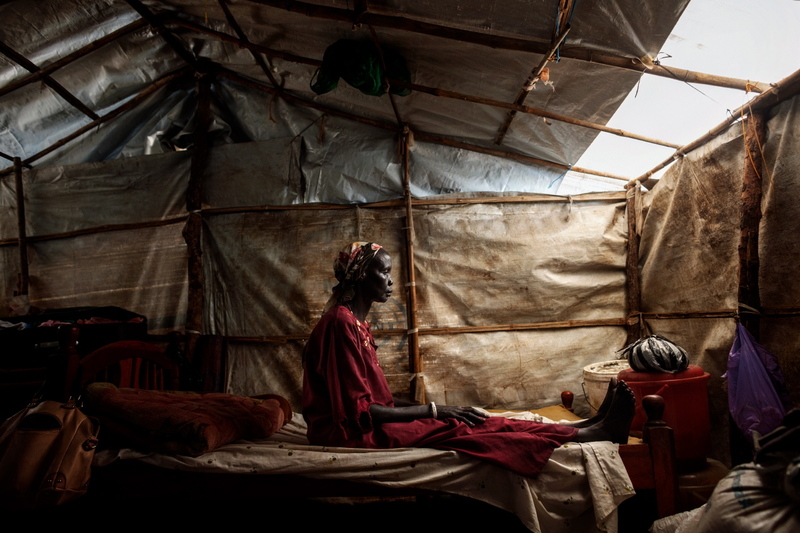 Her mother Martha escaped from her village in 2015 to reach the IDP refugee camp in Juba. Her father is missing. South Sudan, IDP refugee camp, Juba, 2017. 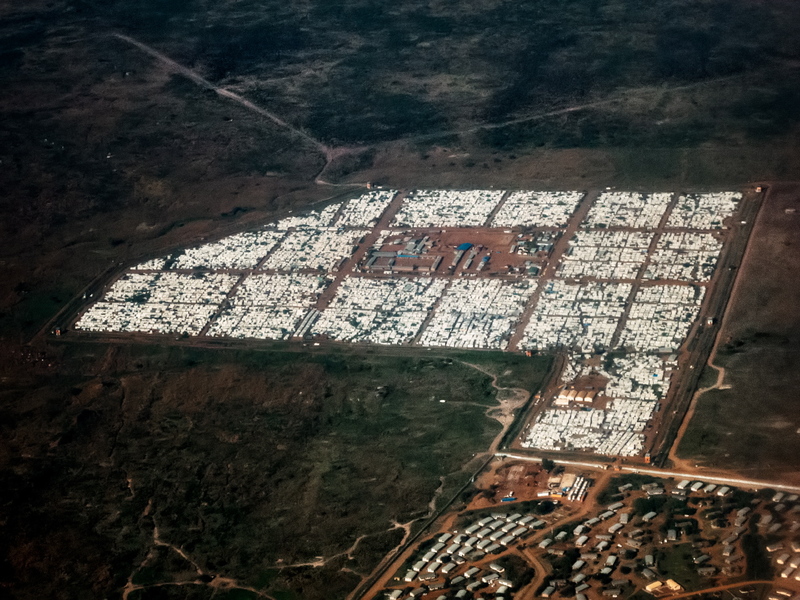 Areal view of the largest IDP refugee camp in Juba. South Sudan, Hai Matara village, 2017. Three sisters, Zaina, 6 years old, Gibson, 12 years old and Silman 8 years old, all suffer from Nodding disease. 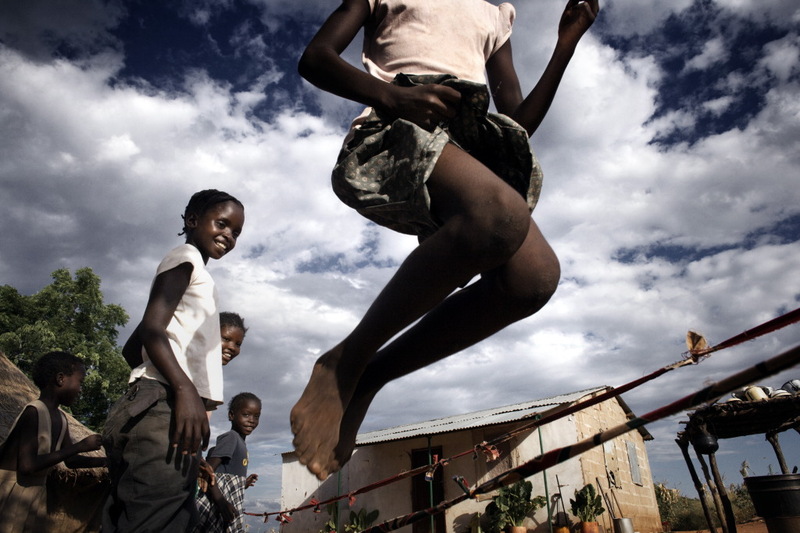 The disease causes a permanent physical and mental disability and it affects young from 5 to 15 years old. Symptoms are peculiar, as when a child is affected by it, both physical and mental growth stop permanently and mental retardation occurs. The name of the disease comes from one of the specific symptoms that come about which is an erratic nodding of the head. These movements generally occur when children are about to have a meal or sometimes when they feel cold and they last approximately 20 minutes. 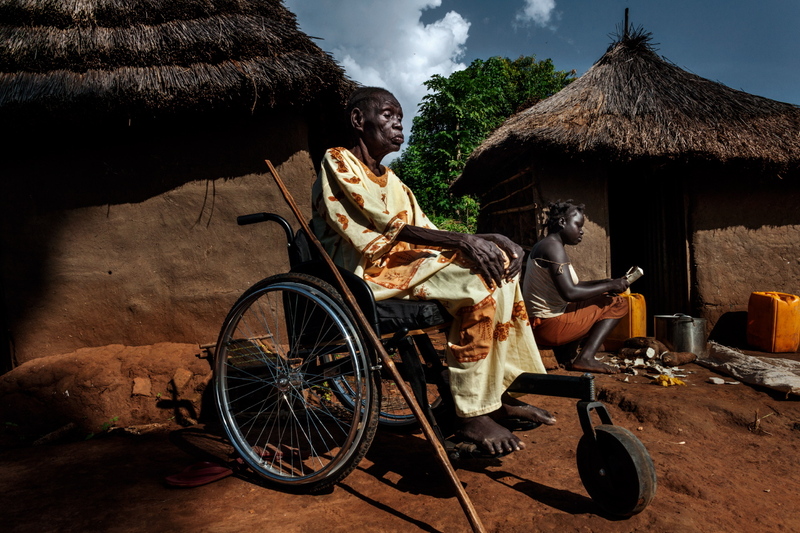 South Sudan, Hai Matara village, 2017. Mary Alab, 23 years old, became lame when she was 18 because of an accident. 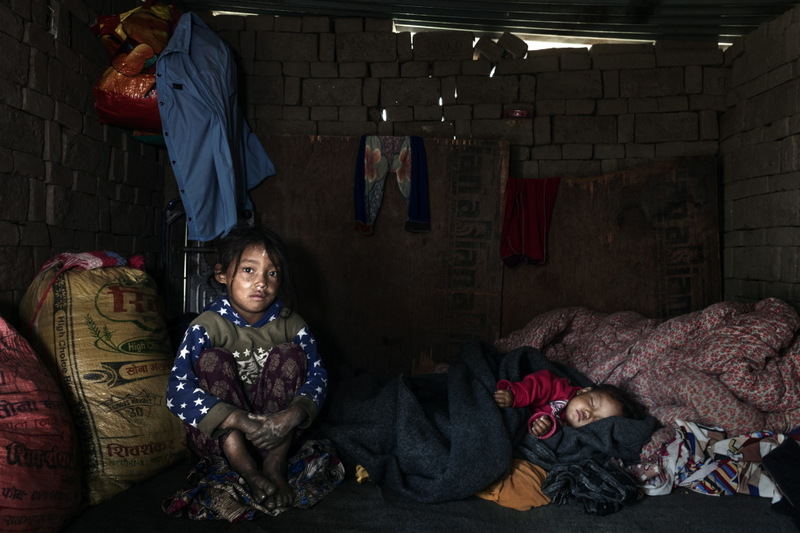 She has lost her husband in the war and she lives with her parents, who take care of her. South Sudan, Hai Matara village, 2017. 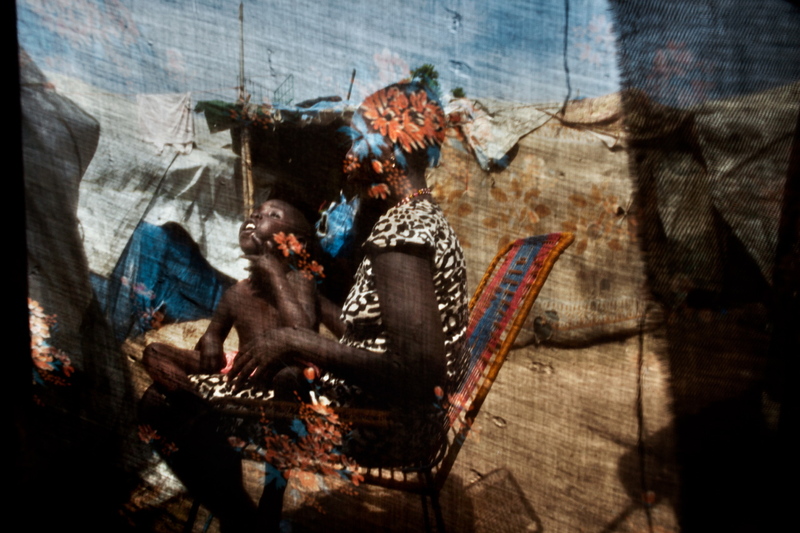 Margaret Festo, 45 years old, with her son Aleson, just a few months old, inside her home. Aleson has been diagnosed with Nodding disease. 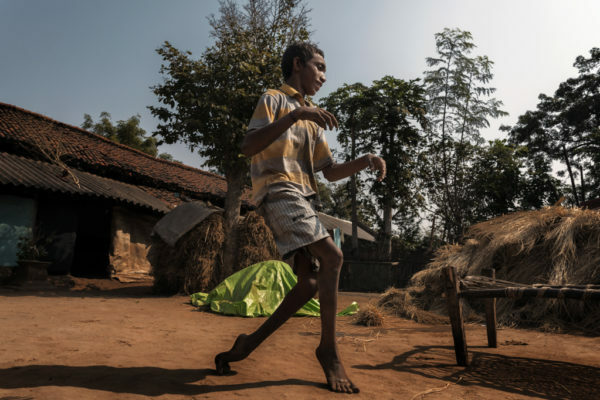 The disease causes a permanent physical and mental disability and it affects young from 5 to 15 years old. Symptoms are peculiar, as when a child is affected by it, both physical and mental growth stop permanently and mental retardation occurs. The name of the disease comes from one of the specific symptoms that come about which is an erratic nodding of the head. These movements generally occur when children are about to have a meal or sometimes when they feel cold and they last approximately 20 minutes. South Sudan, Hai Matara village, 2017. 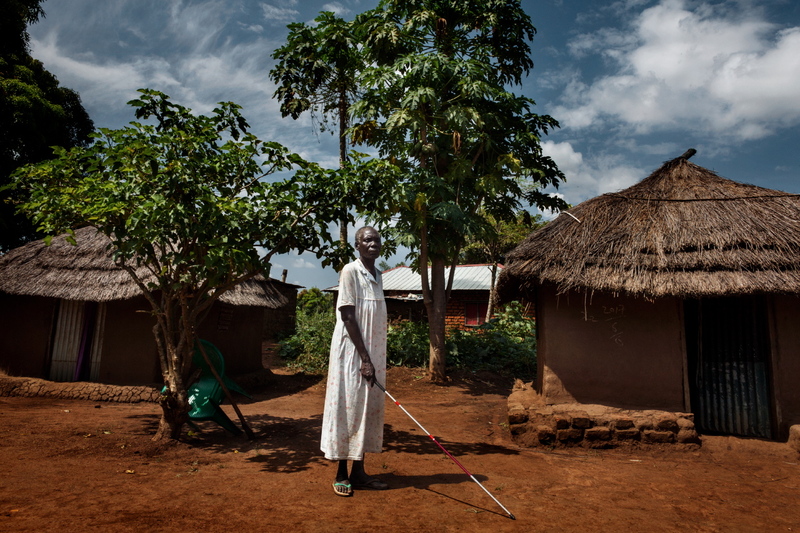 Agnes, 54 years old became blind in 2000 and together with her mother she takes care of her only daughter. South Sudan, Hai Matara village, 2017. Ota Koltong, 27 years old, in her home. 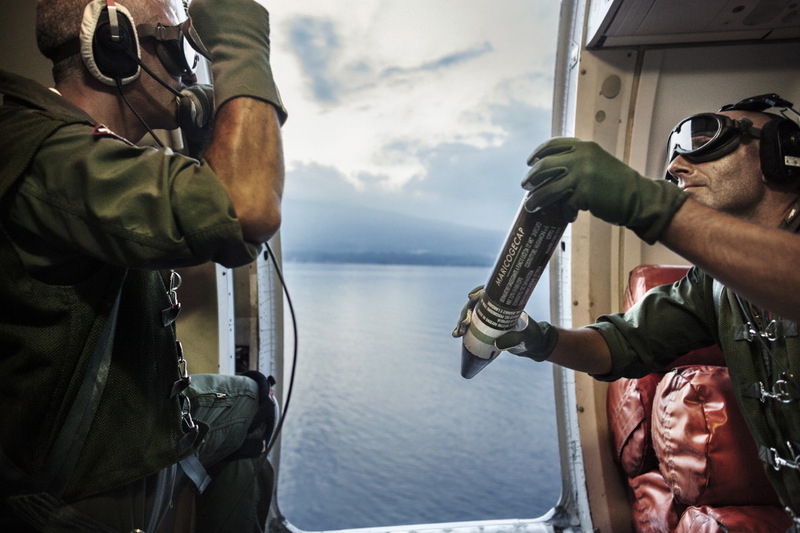 Otan suffers from Nodding disease. He can hear what is being said to him but he cannot understand. 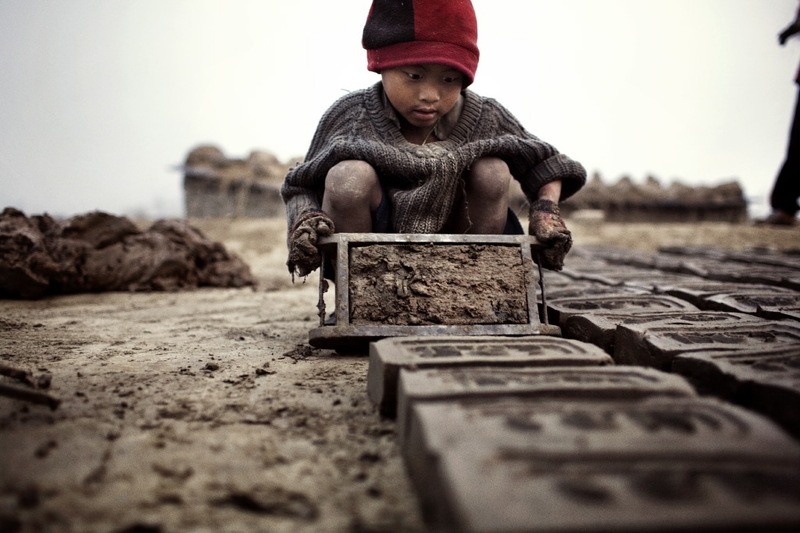 His mother is completely blind. South Sudan, Mahad IDP refugee camp, Juba, 2017. 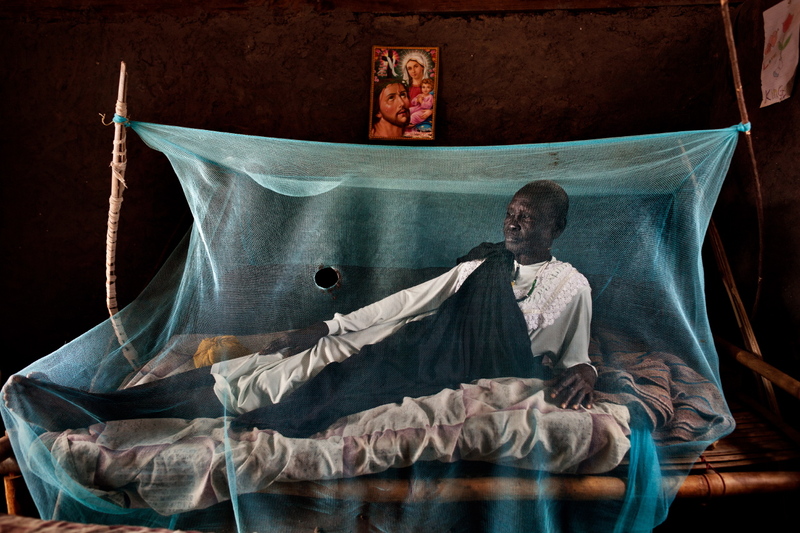 Ariet Apangi, affected by malaria, in her bed. 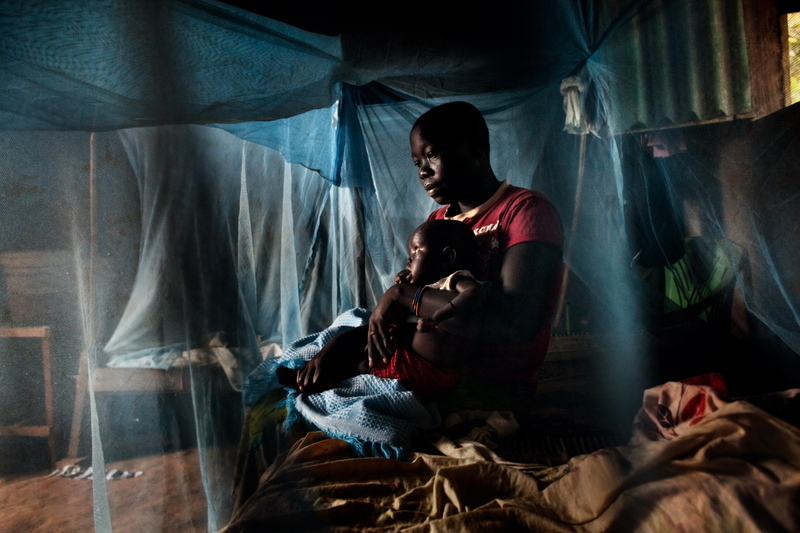 Dr. Isaac Mapeer, deputy head of Malaria Control Program at South Sudan’s Ministry of Health, said: “This year’s malaria is the most severe the country has ever seen,” There is a total of over 900,000 registered cases of malaria,”, adding that 4,073 deaths were recorded since February this year, while 2,000 deaths were reported in 2016. Sud Sudan, Rumbek, 2017. 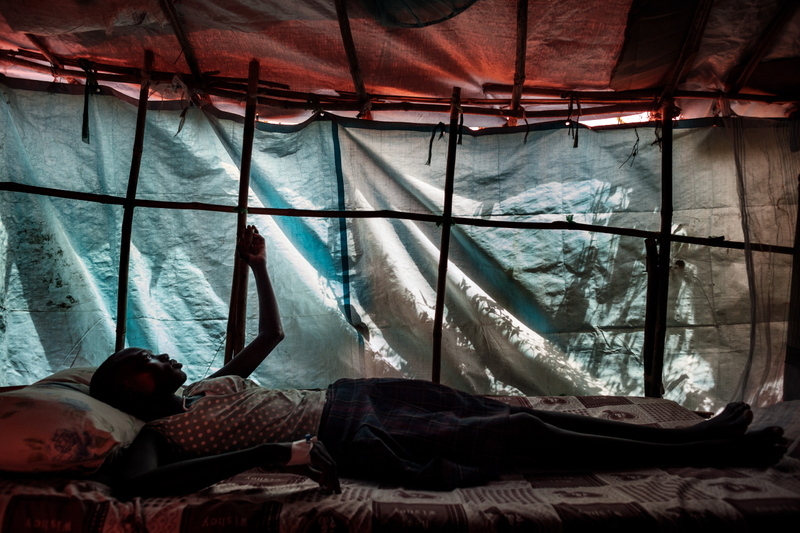 Martha Peter, 56 years old, back in her cabin, after having been visited at the Eye Clinic Centre in Rumbek. 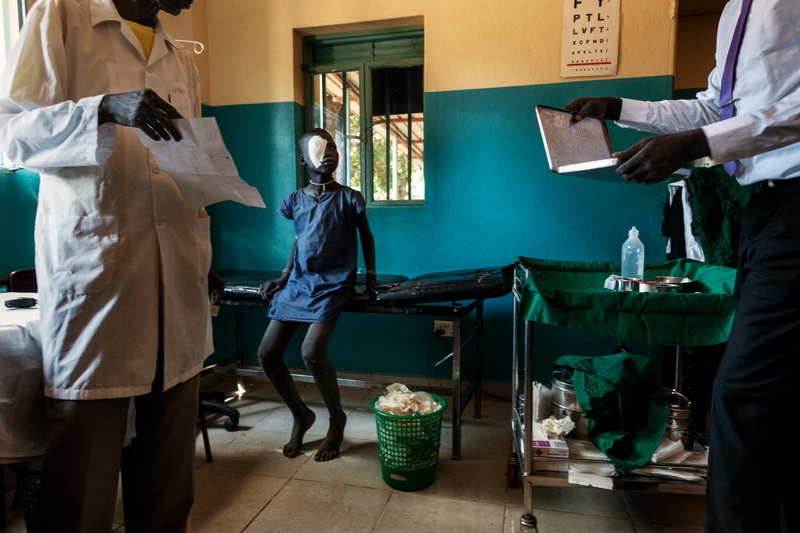 She suffers from glaucoma and is waiting to be operated on in Juba. This will be possible only when the roads will be safer and cleared from rebels. South Sudan, Mahad IDP refugee camp, Juba, 2017. 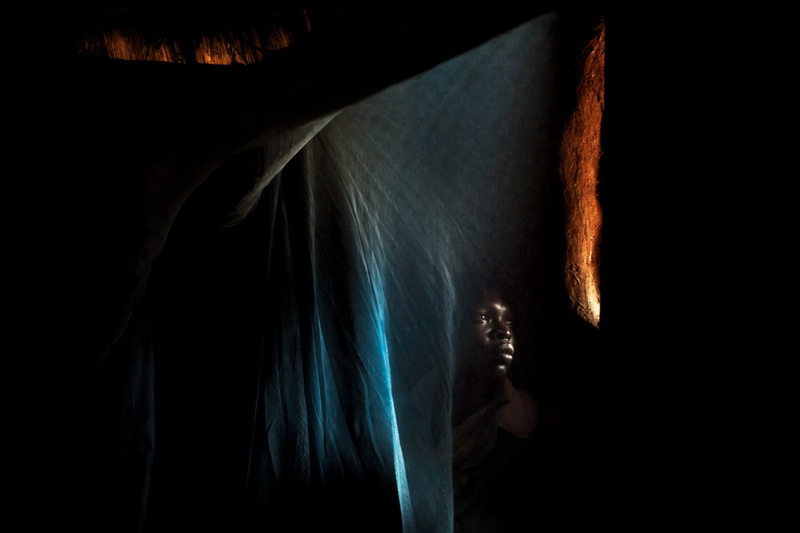 Mary Nyameri, blind from birth, lives together with her two daughters who take care of her. South Sudan, Mahad IDP Refugee Camp, Juba, 2017. 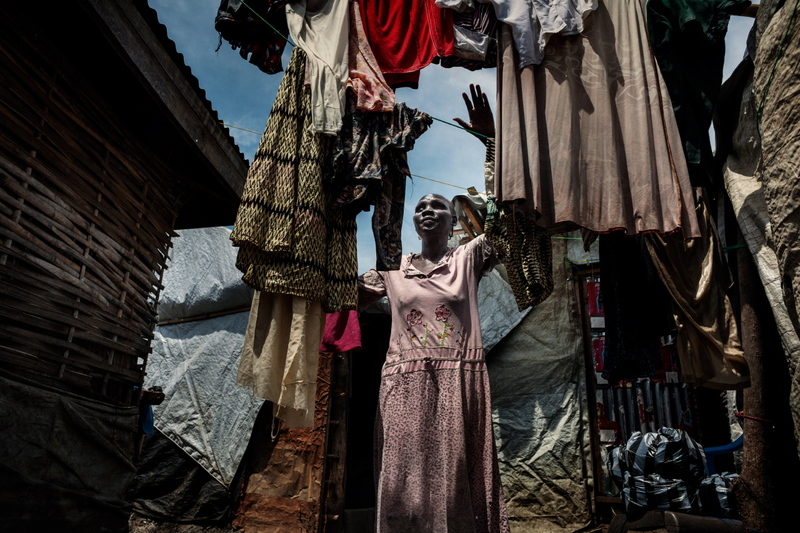 Kemise Kange, 45 years old, as she hangs the clothes on the line outside her home. She is blind from birth, she however is able to perform simple daily activites. She lives with her mother Mary Mivoyi, 60 years old. Kemise is mother to 4 children, who live in different villages in the northern part of the country. South Sudan, Hai Matara village, 2017. Yucunia Tombe, 12 years old, inside her home. Yucunia suffers from a very severe form of Nodding disease. The first symptoms started in 2005 but the disease worsened over the last couple of years, since her mother Rose was unable to pay the medicines for her. The civil war has caused for many small commercial activities to stop, such as Rose’s small business, which was to sell agricultural products at the Mundri market. Yucunia’s father was killed in January 2016. 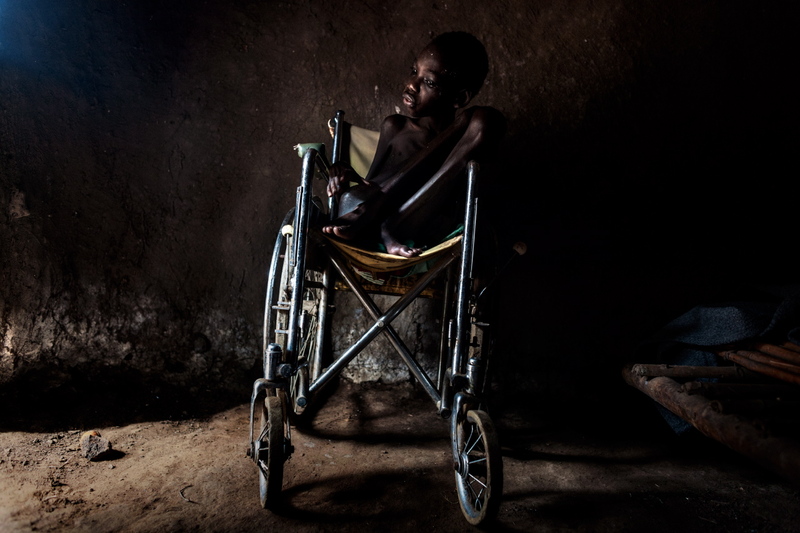 Nodding disease is a recent and little-known disease emerged in South Sudan, Tanzania and Uganda in the 1960s. It is a mentally and physically disabling disease that only affects children, typically between the age of 5 and 15 years old. South Sudan, Hai Matara village, 2017. 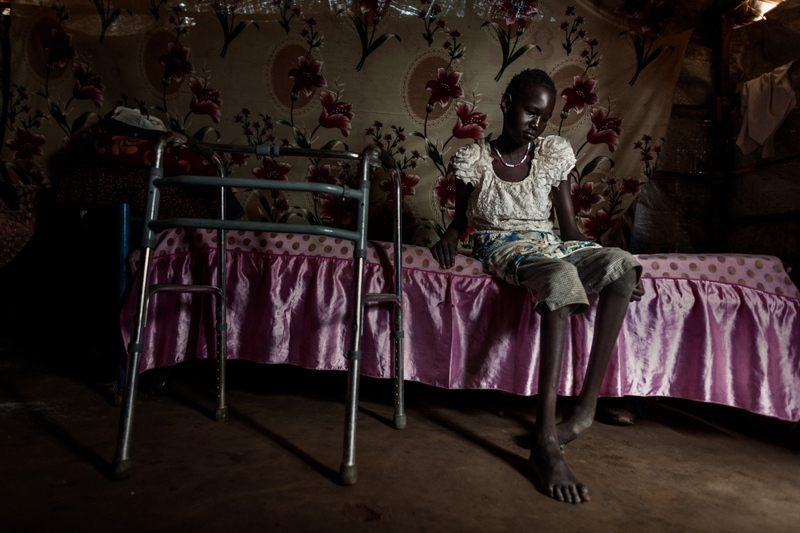 Mary Nyamer, 11 years old, on her bed suffering from pain due to Clubfoot deformity. South Sudan, Hai Matara village, 2017. Janet Danyi, 62 years old, she is both physically and visually impaired. She is constantly taken care of by her daughter Agnes. South Sudan, Hai Matara village, 2017. 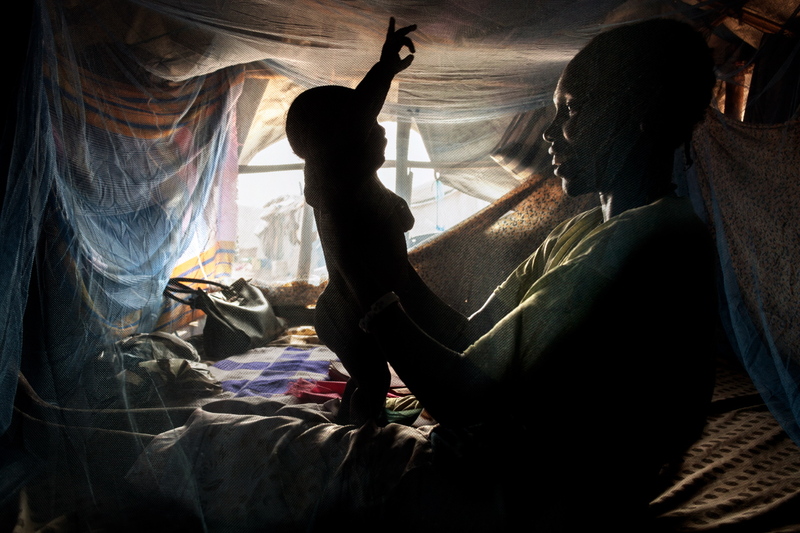 Gisan, the mother with her son Garob Geofey , 3 years old, in her home. Garob has a mental illness and is not able to sit or crawl. South Sudan, Mahad IDP refugee camp, Juba, 2017. Angelina, 23 years old, with her son Rio, 5 years old, affected by a brain disease. South Sudan, Mahad IDP refugee camp, Juba, 2017. Apayi Sam, suffering from glaucoma since 2013, has been operated on in 2015 but without success. South Sudan, Hai Matara village, 2017. Bokili James, 13 years old, inside his cabin. James has TBC since 2016. His parents take care of him but they are not able to take him to a proper medical establishment where he could receive proper treatment. The capital Juba is the only possibility but it is impossible to reach because the roads to get to it are dangerous because of the rebels. A flight to the capital is not an option either because it is far too expensive. South Sudan, Mundri, 2017. Dr Amin Seth Leui, 34 years old at the Ophthalmic Chemical Office. 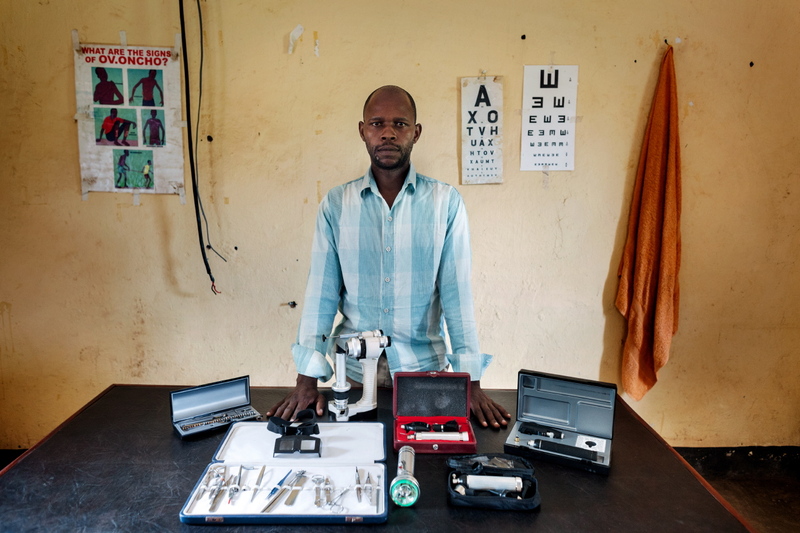 The only medical instruments are the ones on the table, every day he must take them home. More than once the Centre has been ransacked by rebels. South Sudan, Rumbek, 2017. 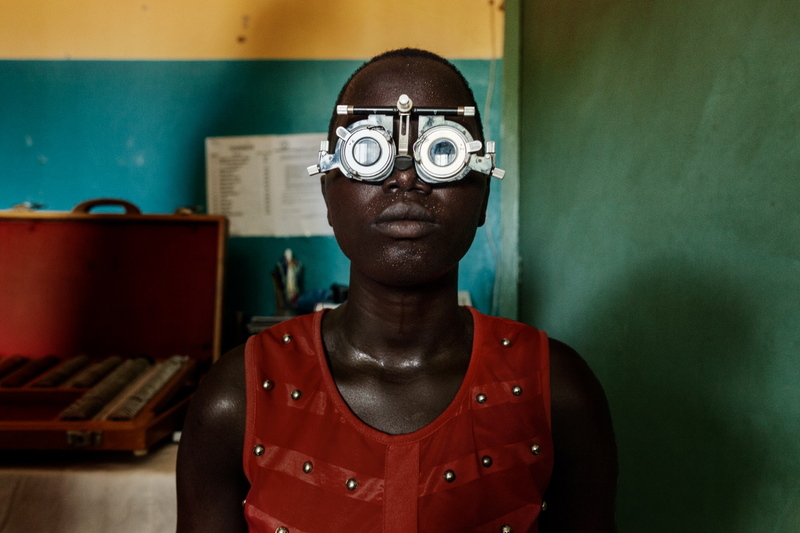 Piat Mabur, 13 years old, at the Eye Clinic. Piat has just been operated on his eye. While he was playing with his friends, he was injured with a stick. The Eye Clinic in Rumbrek is the only centre for the whole region. There is one doctor, two assistants and a secretary. South Sudan, Rumbek, 2017. Piat Mabur, 13 years old, at the Eye Clinic. Piat has just been operated on his eye. While he was playing with his friends, he was injured with a stick. The Eye Clinic in Rumbrek is the only centre for the whole region. There is one doctor, two assistants and a secretary. 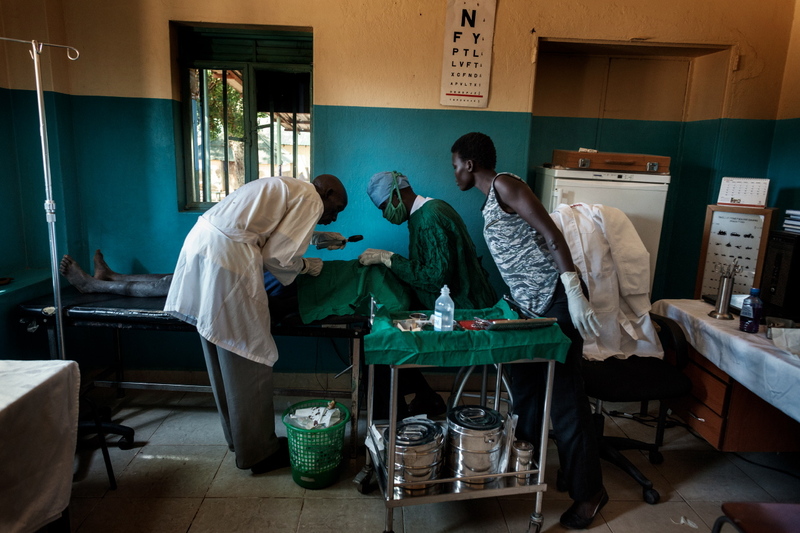 Thanks to the donations from the Nando and Elsa Peretti Foundation they are able to buy medicines and the necessary technical instruments for small surgeries. South Sudan, Hai Matara village, 2017. 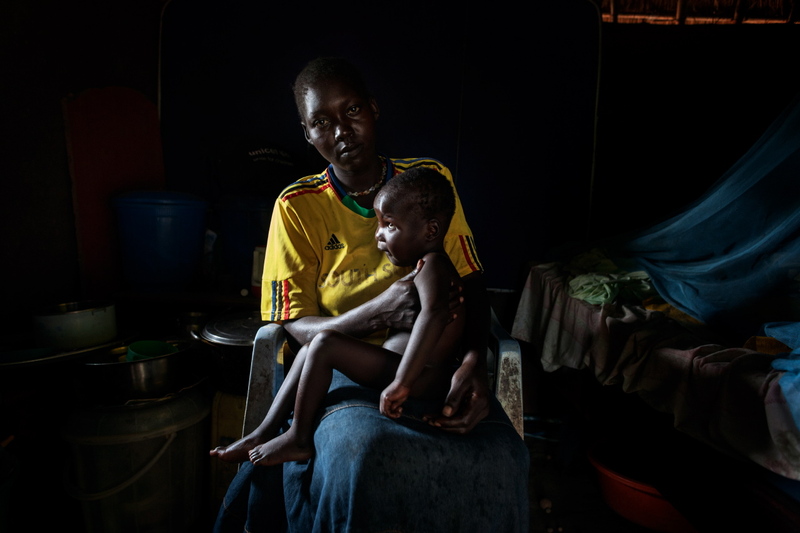 Charity Bouda, 26 years old, blind from birth, while she breastfeeds her daughter Alice, 3 months old. 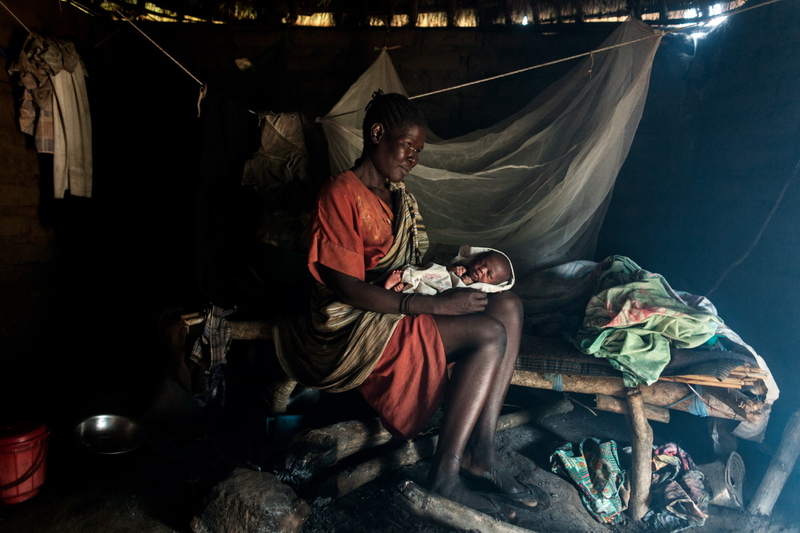 Alice’s father has disappeared after their village was attacked and her mother was in the late stages of pregnancy. Charity is assisted daily by her brother and sister-in-law.